Stay tuned for information on our 2019 Retreat! 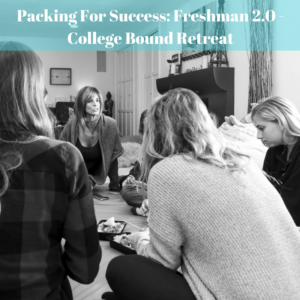 Our Freshman 2.0 College Bound Retreats are 1-day experiences designed to connect your daughter with college women who have “been there before”, and who know what the “real deal” is. The program enables your daughter to interact with an experienced college transition coach and upper-class women mentors in a small group setting. Reinforce her values-based decision-making skills, learn how to adjust to her roommate, deal with boys, manage homesickness, strike a balance between her social and academic lives, and – most importantly – stay safe. We’re here to help your daughter make the most of your college transition – socially, emotionally and academically. Contact me at pam@willseyconnections.com to discuss your daughter’s needs. Together we will ensure that her college transition the positive and exciting experience it was meant to be. Providing college-bound girls with the tools they need to successfully transition from high school to college. College Transition Coaching & Freshman 2.0 College Bound Program from Willsey Connections on Vimeo. DIY Assessment: Is your Daughter Ready for College? Your daughter basked in the glow of senior prom, the two of you did the happy dance when you opened her college acceptance letter hopefully, and you looked on with pride, excitement — and a little nostalgia and maybe a tear or two — as she received her high school diploma. These memories will live on forever. But, while all of the work to get you to this moment is behind you, your daughter will soon be facing the most critical transition of her life to date: her freshman year of college. This is a transition marked — for parents — by worry, excitement and anxiety as they send their daughter away, maybe for the first time. If you’re like many of my clients, the hopeful optimism of “she’ll be fine” is — at times — overshadowed by worry and fear about what may happen when your daughter is no longer under your watchful and caring eye. — Will I make friends easily? — Can I successfully balance my academic and social life? — What if I hate my roommate? — Will I miss home and my friends? — Am I really ready for this huge change? You’ve already done so much! You mastered the admissions process. Her SAT/ACT scores are a thing of the past. Her acceptance letter is a piece of paper you’ll cherish for a long time, and — soon — you’ll submit the first of many checks to the college of her choice. Move in day is looming and will be an exciting and warning: expensive venture, as you set her up in her home away from home. But none of this necessarily equips her with the specific skills necessary to manage the social and emotional challenges of this upcoming transition. Willsey Connections is here to help you and your daughter through this transition. I invite you to contact me directly with any questions or to inquire about scheduling a private session.